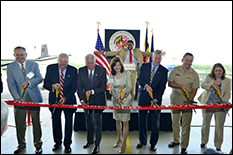 On Tuesday, August 5, 2014, nearly 200 people gathered to celebrate the opening of the University of Maryland (UMD) Unmanned Aircraft Systems (UAS) Test Site in Southern Maryland. The ribbon cutting ceremony took place at the St. Mary’s County Regional Airport in the California, Md., where guests filled the Maryland State Police Medevac Hangar. Distinguished guests and speakers included Congressman Steny Hoyer, Maryland Delegate John Bohanan, University System of Maryland Chancellor William “Brit” Kirwan, UMD Provost Mary Ann Rankin, NAVAIR Commander Vice Admiral David Dunaway, NAWCAD Executive Director Gary Kessler, Mid-Atlantic Aviation Partnership Executive Director Rose Mooney, Aurora Flight Sciences President John Langford, St. Mary's County Commissioner President Jack Russell, UMD UAS Test Site Director Matt Scassero, and Clark School Dean and Farvardin Professor Darryll Pines. Program speakers echoed their commitment to supporting the UAS endeavor, and touched on their hopes for improving educational opportunities, infrastructure, and technological innovation in Maryland and throughout the nation country through the effort. The ribbon cutting ceremony was followed by a networking reception and research demonstrations by UMD students and industry partners. Learn more about the UMD UAS Test Site.